Each episode of The Science of Fiction picks a theme and discusses the science and non-science in fiction involving that theme, with hilarious results, a selection of tenuously-related music, and a constant stream of guest experts. Expect anything from the mechanics of time travel to advice on how to survive the impending zombie apocalypse! Past guests include Helen Arney, James Grime, Andy Pontzen and far too many more to fit here. Dr Andy Holding researches protein binding by day, and is a public speaker, stand-up comedian and instigator of the Cambridge chapters of Skeptics in the Pub, Bright Club by night. Will “Jefferson” Thompson, Esq. is an open source software engineer by day (and sometimes night), and a musician by night (and sometimes day). To celebrate the release of Star Trek Into Darkness, serial guest James Grime has taken on the arduous task of re-watching the original series to study the mathematics featured on the screen. 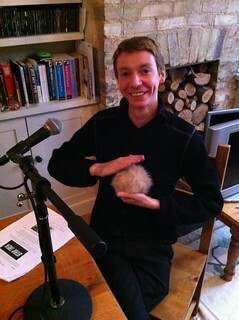 He joins us for a podcast-only special to tell us all about it, with audio clips of the relevant episodes. We'll talk about cicadas, morphogenesis (or “waves on cows”), deceiving androids from first principles, and the biggest question of them all: does the redshirt always die? If you want to check James’ working, he's published a series of posts over at The Aperiodical on the same themes: part I, part II, part III. Please enjoy this photograph of Gödel, which we mention towards the end of the show. 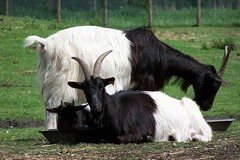 Please also enjoy further information on the remarkable Valais goat. The short skirt uniform worn by both men and women in early episodes of The Next Generation is called a skant, and it was occasionally worn with trousers. as quoted by Peter Rowlett in What colour shirt do mathematicians wear?